ZHUKOVSKY, July 18. /TASS/. 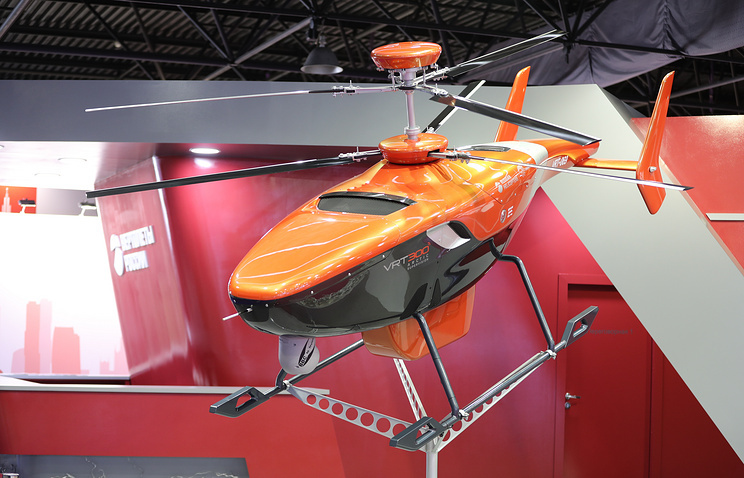 Russian Helicopters (part of the Rostech corporation) has displayed the prototypes of rotorcraft unmanned aerial vehicles (UAVs), or drones, for ice observation and operation in the Arctic environment, as well as for monitoring and remote sensing, the company’s press service reported on Tuesday. "The VRT 300 system has been designed and is being exhibited at the MAKS-2017 in two versions: Arctic Supervision, which has a side-looking radar for ice observation and operation in the Arctic conditions, and Opticvision, which has an increased flying range for monitoring and remote sensing," the company said in a report. The system may be used to transport various cargoes (products and medicine) between a ship and a polar station. The unmanned helicopter can also measure ice thickness along the ship’s route, conduct search and rescue operations at sea and assess large ice fields in which polar stations can be set up. The VRT300 Opticvision was designed to develop the system of diagnostic assessment, prevention and liquidation of emergency situations in exploration and transportation of energy sources. The system’s functions also include checking power transmission lines, mapping, cargo transportation, search operations, and monitoring the environment and road facilities. The system has a mobile drone operation center that is also presented at the MAKS-2017 International Aviation and Space Salon.